We (William and I) are on our way to invest in the latest model of ....Washer and Dryer machines!Uhu, rather than in the latest fashion or the car or gadget. So, our lives is turning into a more domestic affair one day at a time. No more late nights at the club-as if we did, NOT! But it feels good to think that at least "we being there-done that..." No regrets. I am enjoying the transition to real adulthood and little by little I look in the mirror and I see my mom. Oh my GOD! I do. This is nothing to be scare about, I am kind of look forward to it- more so because my mom has gracefully aged. She is a very stylish lady and those of you who know her will agree. So at least I know that my wrinkles will take some time to actually show up. We still have a lot of arranging to do around of the house in preparation to receive Keelan Francis in our home-soon to be her home. I am hoping she will like the way we decorate-yes were a bit eclectic and eccentric and artsy, but I really hope that this rub off on her. We hope that as she grows up, she will be as excited and interested in life as we are. You know, art, music, culture, conversations, travel, education, as so on. So far, in our immediate future, I just want to be able to enjoy her and feel prepare to manage all the little things that will come up. One thing is clear...she will be expensive!!!!!! Starting with her day care- and believe me it is not easy to find a clean, well organized, responsible place. There are many places and mot all are as I will refer to "kosher". "Babies r us" and they are also money maker for a lot of other people dedicated to convince us that we really need to purchase that device so we can hear the heart beat anytime we want It is a must, how can we not have it? I have never sen so many baby stuff in my life until now. So if you are expecting-beware. Do your research, maybe you do not need to buy the $800.00 scary name stroller Buuu-ga-boooooooo! I am finally-or closer- to settle with the one that stings and ride with a crown to rule the world... "Bumbleride Queen B". Not inexpensive but half the price of the "scary one" and I can use it up to 65 pounds. So for the next, 3 to 4 years maybe almost five (with proper nutrition) my girl can ride comfortably in style and we will not have to spend in mew strollers. Well, maybe a I will get a McLaren later--they are ultra lite a great for traveling, sturdy and a great price-good quality. I have become a baby product expert. Unbelievable. Just an ultrasound of Keelan. Today I start my 3rd trimester. 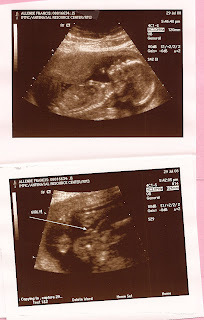 I will get a new ultrasound image. And all is well in Keelan's world. The story ends well. After 23 hours of observation the doctors released me as everything seems to in good shape. However, for the next couple of days I have to be vigilant of any sudden change in the baby movements, any bleeding, etc. 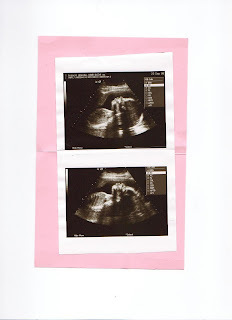 Today, Baby Keelan is doing fine in the womb and moving as if there was some party going on. I was a bit sore and concerned on Friday about the placenta but it is were it needs to be along with everything else. And yes, my ego has been restored. For the rest of this semester, luncheons at the cafeteria are not an option for me. At least not during peak hours. So, I will enjoy visiting with my students and having lunches in the safety and peacefulness of my classroom away from the tumultuous lunch periods. I will miss the lunchroom as I like socializing with my students but for the next four months Keelan's well-being is first. And that is what happened...that was the reason I missed the annual "All Girls" camping trip.